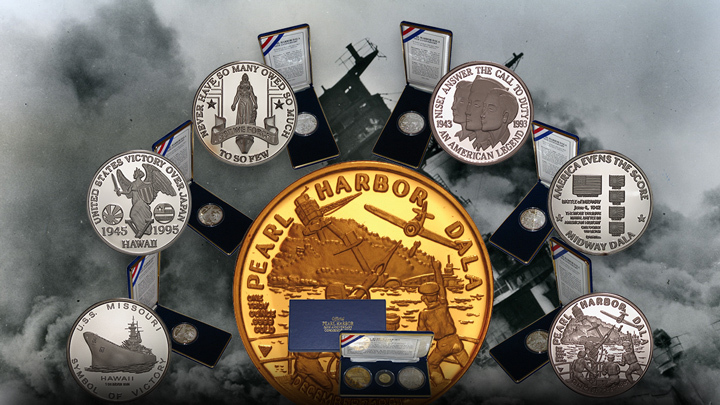 Due to Hawaii’s unique island location in the Pacific Ocean and Pearl Harbor's role in World War II, the Mint was honored to issue the national commemorative for the 50th anniversary of the 1991 attack on Pearl Harbor for the Pearl Harbor Survivors Association. This was followed by a unique collection of Military Issues that included the Official commemorative for the 50th Anniversary of the 442nd Regimental Combat Team (RCT) whose motto: “Go for Broke” led the only Japanese unit in US military history to be the most decorated unit in World War II; the Battle of Midway, the most decisive naval battle in history; the Liberation of Guam; V-J Day and the End of World War II commemoratives complete the Military Issues. The deluxe packaging of the Military Issues for World War II produced a world class commemorative for a world wide event.